I keep getting these emails with questions regarding what on earth is that device that constitutes the background of my website. When I explain that it is my OTL amplifier, we usually start with a standard “What is an OTL ?” … Then we go to the “But it is not possible for it to work in such a non-paralleled output tube configuration, etc, etc. Gradually, I observed a tendency that I am repeating the process time and again, so maybe it will be better if I will just drop in a post in here with some basic description. Some background information: my relatively non-standard device was created during a period of several months of 2012. I just managed to finish it of for the AudioShow exhibition, which is usually held in Warsaw, each year, on the 10~11 November. Together with some other fellow DIY enthusiasts we presented our creations in room 608 of the Radisson BLU Sobieski Hotel, a room designated as “DIY audiostereo”, after the name of it’s sponsor ( http://www.audiostereo.pl ), a Polish on-line Hi-Fi and Hiend Audio magazine, but also a very good forum. As a matter of fact, and custom, the “608″ is the only NON-COMMERCIAL room throughout the whole exhibition. 40 kg – Power supply box (the lower one, in black). 35 kg – Signal path box (the upper one). 75 kg – Total weight. * transformers and chokes – about 30 kg. * HV capacitors – about 25 kg., of which about 15 kg is HV electrolytics, 10 kg this paper in oil, Teflon and polypropylene. The total installed capacity in the HV power supplies is about 100 000 uF, of which about 1,000 uF is paper in oil, Teflon and/or polypropylene (MKP) or polystyrene (MKS) or polycarbonate. Power dissipation of the anodes: about 120 watts. Power Tubes cooling – only convection, noiseless, without fans. Power Consumption at normal listening levels – approx. 300 ~350 watts. The soft start circuits limit the current at switch-on so as not to exceed 10A. Output: … well this is a difficult subject. Let’s say it is about 2 x 30 W.
The switching on procedure encompasses a total of 5 phases and it takes around 3 minutes to achieve a state of readiness. It takes some additional time, say 5 minutes, for the device to fully heat up, so that the sound achieves the best quality. After pulling the mains power cord from the socket, the device keeps on playing music for about 1,5 minutes. The open feedback loop output impedance is around 20 ohms. The closed feedback loop impedance is about 0,2 ohms. 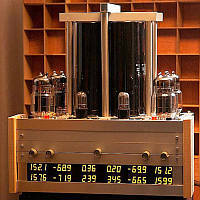 The design is based on a balanced bridge topology, with a pair of Russian power tubes in a Push Pull configuration, with the loudspeakers connected directly between the tubes. The other side of the bridge is constituted by a floating power supply of 320V, subdivided into +160VDC for the upper tube, and -160VDC for the lower tube. 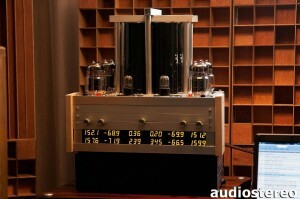 The loudspeaker is protected by a loudspeaker fuse, the “fast” type, with a rating of 4 Amperes. This is a classical design with no output transformer. (OTL – Output Transformer-Less). At the same time – it is a design without any DC offset protection capacitor, separating the loudspeakers from the tubes (OCL – Output Capacitor-Less). 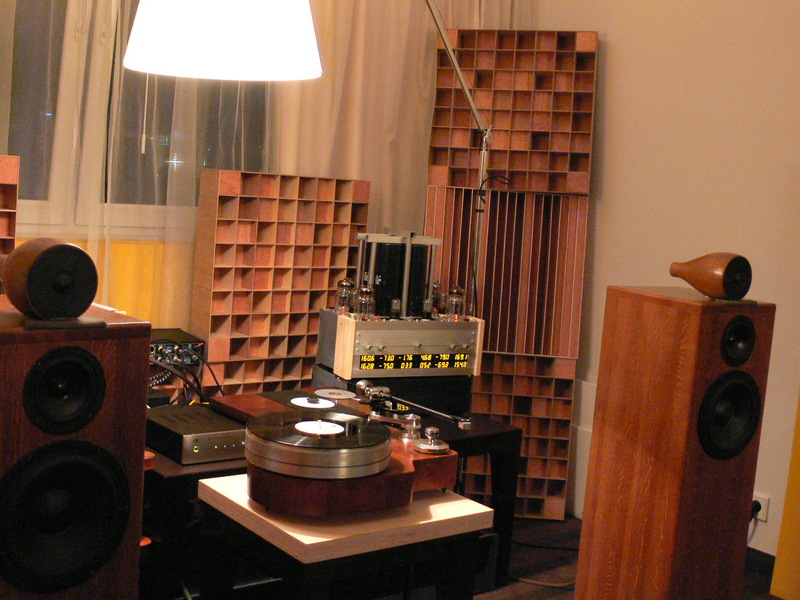 It was empirically proven time and again that the speaker fuse suffice to protect the speakers. But please, do not ask the speakers as to their opinion about this issue. They are very nervous about the whole situation. The fuse is perfectly happy in providing protection against a DC offset of 160VDC (worst case scenario). The entire signal path is implemented in “9999″ grade silver. 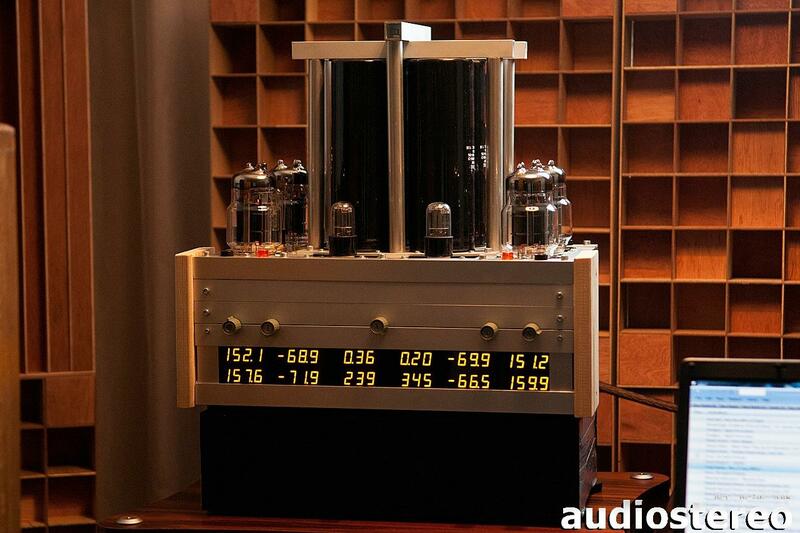 Starting from custom silver-plated RCA input jacks, up to silver plated speaker terminals. Internal signal wiring is executed with solid core silver wire, “9999″, of 0,4 diameter. The high current output stage uses silver plated copper, 2,5 mm2. bypassed with 9999 silver of 0.8 mm diameter. The entire signal path is soldered with “Mundorf Silver Supreme” with a fair amount of silver content within the mixture. The results are very satisfying (providing that nothing is “happening”). That’s about it. Ah, yes… there is also the question about all those crazy digital voltmeters. That is “easy”. They are life savers. They tell me, during startup, and during operations, if all is fine and I can sip wine and relax and listen to the music, or if all is not fine and it is time to run and take cover, preferably ripping the power cord out of the wall on the way. Each channel has six displays; two for upper and lower power tube’s anode voltage, the next two are their respective bias voltages, then there is the ‘idle’ current and the “asymmetry voltage” upon the speaker terminals. It is generally preferred that this voltage is rather in the tens of millivolts range, as opposed to the hundreds of volts range. The central knob is the volume pot. The other four pots to the sides are fine precision, multi-turn potentiometers so as to fine tune the balance of the bridge, if need be. And the need BE indeed, from time to time, because these specific Russian tubes, the “Devils” as they are called … have righteously earned their nick name. They are small devils in disguise, with a vengeance, malevolence and a bit of irrational behavior. But then again, if they are suitable for use within the Russian jet fighter aircraft of type MIG-25, then maybe they are not as bad as the legend has it, if you do not mis-treat of abuse them. Let’s just say that their ill temper is rightly justified, occasionally, whenever I overshoot the maximum reasonable music volume. If you were a tube, would you be happy about delivering peak currents of up to (and sometimes over) 4000 milliamperes, each time the music hits the strings on a bass guitar and / or percussion and drums ? Even the pdf spec’s would be shocked, comparing those fused 4000 mA at the speaker output to the maximum allowable P_max of 32 Watts per tube, i.e. a current limit of 32W / 160V = 200 mA. And, mind you, about 50~60% of that limit is the idle current, which is set at a level no less than 120mA, in order to get a reasonably hot AB class of operation, which results in a very special sound and performance. If my calculator is not broken, then that idle current, together with those peaks of ?000 mA (?!) would be an abuse by a factor of 2000 percent. If we assume a conservative 25 Watts of music power into a 6(~8) ohm load, I guess I am pressing them with 2 Amperes every once in a while. No wonder that the devil’s *** really *** get fed up with me from time to time and complain about it. I respect the opinions of those who say that this device contradicts the laws of physics and that it is not possible for such a construct to function properly. I myself belong to that group. I listen to it. I play it. I torment it daily, sometimes for multiple hours. I simply love the transformer-less sound. And I still don’t believe it.